The OneLift™ provides a standard turnkey submersible pump station product with the distinction of having a sole-source point of responsibility, and can be installed in less than a day. The OneLift™ Pump Station is designed with an integral valve vault built into the unused top portion of the wet well, which yields a single-structure product, that solves the problems of differential settlement found with the conventional 2-structure systems. The OneLift™ by Oldcastle Infrastructure, provides a standard turnkey submersible pump station product with the distinction of having a sole-source point of responsibility. 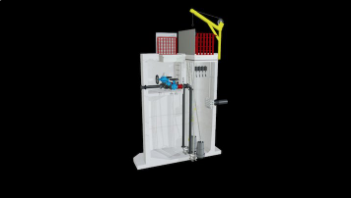 The OneLift™ Pump Station is designed with an integral valve vault built into the unused top portion of the wet well, which yields a single-structure product, that solves the problems of differential settlement found with the conventional 2-structure systems. In addition; the single-structure design significantly reduces the product footprint for sites with tight area restrictions, and reduces complexity, size and cost of the excavation. The OneLift™ has proven to significantly reduce the time required for site installation. OneLift’s standard innovative design allows for quicker project documentation, faster product delivery and repetitive high quality manufacturing. The factory built OneLift™ pump station offers a monolithically cast valve vault, in what is typically an unused portion of the pump station. This results in a significantly smaller footprint – up to 50% smaller than conventional 2 structure pump stations – allowing it to fit tight sites. The innovative shape and structural design provides ample space for the interior valve vault, while increasing workable system volumes and decreasing the depth of the excavation. The integral valve vault also eliminates the risk of differential settlement that is inherently associated with two structure systems. 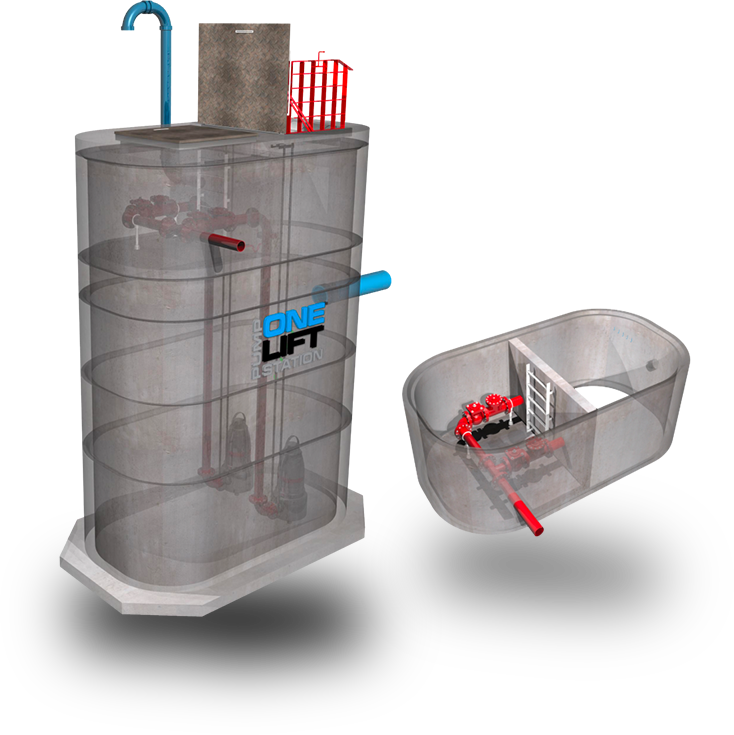 The OneLift™ pump station structures have been designed with a patented base module that incorporates rounded corners and a sloped bottom to help facilitate flow and prevent solids accumulation. The base module structure also embodies buoyancy footing sizing and is designed to prevent flotation without requiring surface resistance or the weight of mechanical equipment when the ground water level is at finished ground surface. The factor of safety against uplift calculated as a ratio of the total resisting force (excluding skin friction and the weight of the equipment) to the total hydrostatic uplift force, is designed to be at least 1.15. The net uplift force shall be transferred to the anti-buoyancy collar. The OneLift™ pump station is factory built from stocked components of various heights to fit specific jobsite needs. Each station is factory pre-assembled and then partially disassembled for shipping. This prepackaged solution allows for field erection and reassembly in less than four hours. You get standard structural and mechanical components that allow for factory stocking, resulting in quicker station deliveries. 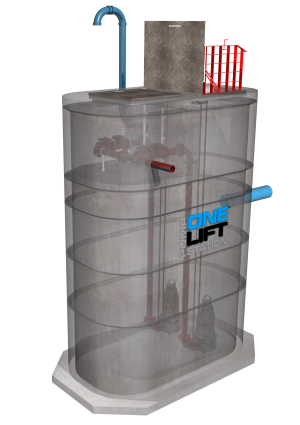 The OneLift™ pump station comes with a pre-assembled equipment package and valve assembly resulting in rapid installation with factory controlled quality components. The RC509 or RC611 pump station with integral valve vault is delivered to your jobsite as scheduled, pre-assembled, pre-tested and ready for installation. In the timeframe of just 4-hours, the pump station can be erected, “plugged-in” to your system piping and backfilled. 12:00pm: Minor reassembly of ship loose items are completed in two hours and backfill begins.